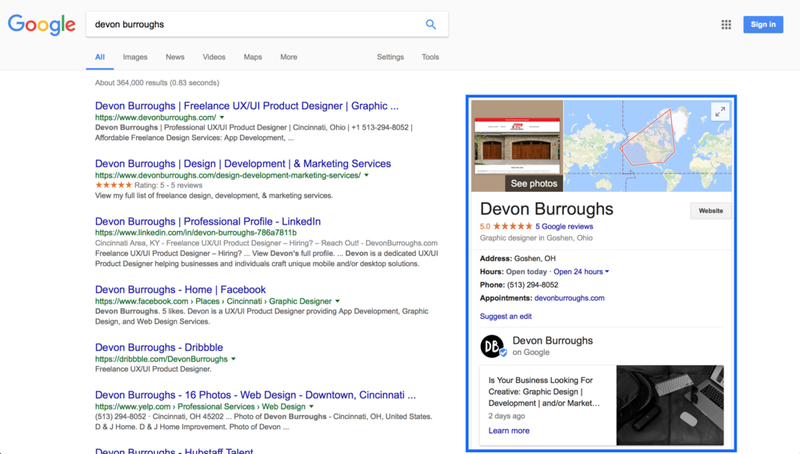 Devon Burroughs | Why Use Google My Business? Give Google Search Traffic Direct Access To Your Business! My clients often ask me about different ways we can work to maximize their businesses digital footprint. There are many different ways of boosting online discoverability. Often with a website for example we would use the term SEO. SEO is a means of analyzing and formatting a plan to boost organic search engine discoverability. An often overlooked or under appreciated tool in improving SEO is Google’s My Business service. Google is by far the most frequently used search engine today and subsequently they are constantly optimizing ways they can improve discoverability of businesses online. In fact, over the last few months Google has been adding several highly beneficial tools (business posts, holiday hours, search analytics) to this (did I mention FREE) service. It’s actually incredibly easy! The benefits far outweighs the 1-2 hours in total (if that) it will take you to setup your page. The first step is having a Google Account and searching for your business (don’t worry if your business is not found). Google is simply trying to confirm that you are not creating a duplicate page of an already existing page. If your company has been added to the Yellow Pages or has been indexed from pre-existing accounts on Yelp, Facebook, or Foursquare and has been searched frequently Google might have already created an un-confirmed page for your business. The information Google uses for these pre-created & un-confirmed accounts often is populated with readily available information that is already online. If this is the case for your business you simply would be taking confirmed control over this already existing page of which you can change any of the information if it has changed for example. Now to gain control of a pre-existing page or to create a new page you will need to enter your address (or the address of your business) and the contact information for your business. This next step is arguably the most tedious of the entire process. Before giving you full control over the page Google will mail you a postcard to to the address you have provided. This allows Google to confirm you actually are the point of contact/owner of this business. Most of my clients have received this postcard within 5 days. Once you have the postcard you will be required to enter the code on the postcard within your account. Once you have completed this step you officially are in control of your Google Business Page. Business Information - This is the basis for your page. Your hours, phone number, images, & address. The idea is if someone Google’s your business they get access to this information as quick as possible (keeping this information up to date across social media and your website will help your SEO). Closed for an upcoming holiday? Change your business hours? Feel free to change this information on the fly whenever you would like. You also have the ability to upload images highlighting your business and services as well. Imagery is one of the best ways to drive overall page engagement. I recommend steadily adding images on a regular basis to keep your page relevant online. Posts - Similar to a Facebook post, posts are snippets of information or highlighted features of your business/services that show up live on your Google Business Page results. Give potential search traffic (aka potential customers) a reason to pay attention to you. With varying types of posts you can choose to offer a service discount, a daily special, or a seasonal updates about your business. Each post remains live for roughly a week and you have access to impression and engagement analytics on a post by post basis. Analytics are a sure fire way to manage your offer all effectiveness of your posts. Knowing which posts are most effective and recreating similar posts will help your business grow! Reviews - The typical go to for new customers previous customer reviews. Feel free to review, collect, and respond directly to feedback given by your existing and previous customers. Being empowered to view and respond to criticism is critical to improving the effectiveness and positioning of your business online. We all learn and grow best from criticism. I recommend for all of my clients to remain calm and courteous when responding to even the most harsh of feedback. Showing direct empathy and action to correcting a situation discounts even the most unmanageable situations. Want to learn more about My Google Business? Looking to have your page managed for you? Do you need to explore new marketing avenues for your business?